Who wouldn’t want to live where it’s summer year round and there’s no such thing as a snow shovel. Welcome to Fort Lauderdale! The city has a population of 178,590 and is within the greater Miami-Fort Lauderdale metropolitan area that is now over 6 million people. The city of Fort Lauderdale has evolved in the last 20 years and is no longer just a spring break destination. With the worlds highest concentration of yachts and luxury boats to explore its unique waterways and canals it’s no wonder that it is called the “Venice of America”. Some that either visit or move here are overwhelmed with all the activities and events. 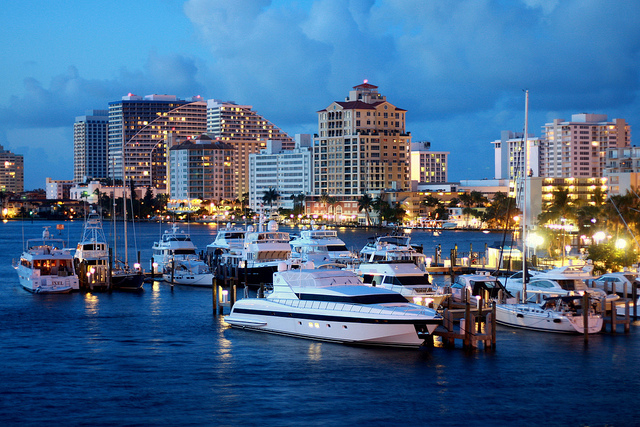 With 4,100 plus dining options and over than 120 nightclubs Fort Lauderdale will keep you busy. Centrally located between ritzy Palm Beach county and ever so busy Miami-Dade county Fort Lauderdale is the “happy medium” for some. The Fort Lauderdale area is now big on big business and is headquarters for: AutoNation, City Furniture, Spirit Airlines, Microsoft Latin America, Marriot International, Citrix Systems, DataCore Software, National Beverage Corporation, TradeKing as well as one of the largest American Express office centers in the nation. The Fort Lauderdale real estate market has many excellent choices: Bal Harbour, Bay Colony, Bermuda Riviera, Colee Hammock, Downtown, Galt Ocean Mile, Harbor Beach, Hendricks and Venice Isles, Imperial Point, Lake Ridge, Landings, Las Olas Isles, Lauderdale Beach, Middle River Terrace, Poinsettia Heights, Port Royale, Rio Vista, Riviera Isles, Sailboat Bend, South Middle River, Victoria Park and countless others. If your looking for a Fort Lauderdale realtor or considering one I would love the opportunity to sit down with you for a free no obligation appointment to see if I can meet your needs. Fort Lauderdale is my home and I take pride in my job and my city. Wouldn’t you love to call Fort Lauderdale home.